Radar image of asteroid 1998 QE2 and its moon taken on June 7, 2013, by the Arecibo Observatory. Several craters are visible on the asteroid, and the moon appears as a bright streak. Each pixel is 7.5 meters (25 feet). A big asteroid that flew past Earth last month belongs to a new category of space rock, scientists say. Asteroid 1998 QE2 and its moon sailed within 3.6 million miles (5.8 million kilometers) of Earth on May 31, making their closest approach to our planet for at least the next two centuries. 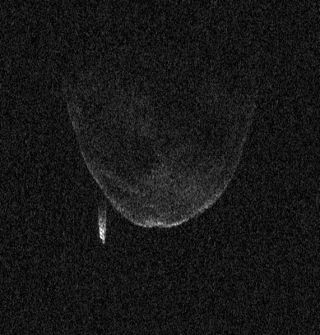 New radar images captured by the Arecibo Observatory in Puerto Rico are revealing just how unique this binary asteroid is, researchers say. The 1000-foot-wide (305 meters) Arecibo dish and NASA's 230-foot (70 m) Deep Space Network antenna in Goldstone, Calif., tracked 1998 QE2 as it approached Earth last month, then kept following the near-Earth asteroid as it receded into the depths of space. The resulting radar images have helped researchers take 1998 QE2's measure. The dark, cratered main asteroid is 1.9 miles (3 km) wide, and it has a 2,500-foot (750 m) moon that orbits it once every 32 hours. "QE2's moon is roughly one-quarter the size of the main asteroid," Patrick Taylor, also of Arecibo, said in a statement. "Similarly, our moon is also approximately one-fourth the size of our planet." Studying the moon and its orbit should help scientists determine the mass of the main asteroid, which in turn will shed light on the object's composition, researchers said. Asteroid 1998 QE2 was discovered in August 1998 by astronomers working with MIT's Lincoln Near Earth Asteroid Research program in New Mexico. The space rock completes one lap around the sun every 3.8 years. There was never any danger of 1998 QE2 hitting Earth during last month's flyby, scientists say. If it had hit us, the damage would have been severe; researchers think that any asteroid bigger than 0.6 miles (1 km) is capable of inflicting damage on a global scale, primarily by altering the planet's climate. 1998 QE2 is one of roughly 10,000 near-Earth asteroids that have been spotted to date. The total population of close-flying space rocks is thought to exceed 1 million. Arecibo's observing campaign of 1998 QE2 came to end on Thursday (June 13), observatory officials said.